Re: Casting a circle necessary? There are traditions that require you to cast a circle, while others don't really mind if you do or don't, and then, as you said, there are traditions that specify when to cast a circle and when not to. I don't cast circles. Circles are often cast to protect ones self or seal something in, still protecting the person doing the casting whether in or outside. I personally don't feel threatened or the need to be protected when I do workings. I feel that protecting oneself in such a manner is often like saying you want to learn about a place, but never venturing there. I was also taught that one does not need to create fire to draw attention to themselves but to become the flame themselves. I have questions about circle casting...Has anyone used it before? I've read a few spells where its called for, but I don't know why but I'm a little afraid to try it. I think its because I'm worried about doing something wrong and something bad happening! I don't like negative things or any bad things. I guess I'm not ready to try something like this, I need to read more about it and learn about it. Even then I think I would still be a little worried about it. Guess my question is are they a MUST in Magick? "Let your courage mount with difficulties. There would be no will if there were no resistance." Okay I understand this as when I was a beginning Wiccan/Witch I feared casting a circle. Normally if casting before bed. I don't know why...but it's something a lot of beginners face I think. However, it's weird because circles are protective. There is nothing harmful about them and I now find being in a circle relaxing and exciting, they radiate such Light. Though keep in mind, circles are a Wiccan tradition, so unless you're a Wiccan, they aren't needed. Even if you are a Wiccan, you don't have to cast one every time you do a spell or ritual. They're definitely not necessary if you're just doing a simple candle spell IMO. Just try casting a few circles...the fear will melt away and I think you'll end up enjoying it. How bout that gold sickle in her left hand? and the Ravens at the perimeter?, pretty cool. My kind of circle, now get out there and give it a shot. Start in the East and go clockwise until you are back in the East. Circle cast! Undo in the counterclockwise direction. Thank you both, I will give it a try when I have all the supplies I need! I do have another question...If you don't remember a chant for your circle is it ok to hold your Book of shadows and read from it while casting?! You don't even need supplies.to cast a circle. And you can hold the BOS while casting. I don't need candles or anything? They aren't needed. But you can use them if you'd like. If you do choose to use candles though, these are the traditional correspondences.. 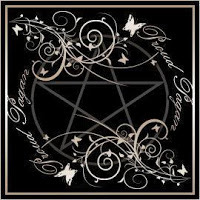 When I cast my circle I have made it a tradition to recite the Wiccan Rede while casting it. It seems to fill me with a more vibrant energy. Of course you dont have to do this just a tidbit I find helpful and so i thought id share. Sometimes I will also just recite this certain part of the Rede "Heed the North winds mighty gale, lock the door and trim the sail. When the wind whispers from the West, all hearts will find peace and rest. " Being a student of magic is a life long endeavor. We are constantly learning new techniques and ways of manipulating energy. One of my teachers used to say, you must be ready to do magic at a moments notice. That would mean I may NOT have all the accoutrements at hand at any given time. Rubbing your hands together briskley and using the pointer finger of your dominate hand, works well when your athame, wand or sword is not around. Casting circle in this manner is just as viable.